I would totally recommend this book to someone else because it is very funny and intereting. The jokes were really funny, and I learnt lots from the facts, but there needed to be more writing. I liked tha it was all about nature, and I liked the squirrel who made funny comments throughout the book. The fact about a pike was really interesting. It's very funny and interesting ,so please read it. I liked this book because so much of interesting, funny and silly jokes and facts. The author has a great mind to think about it. He's truly a genius. There are some true facts too. So exciting to read the upcoming books too. This book is so interesting to read. Funny jokes to laugh out loud. I think you could even put some more funny jokes to read. I prefer to make more books like these. I love it very much. It is very natural! Funny and quite helpful if your into nature! 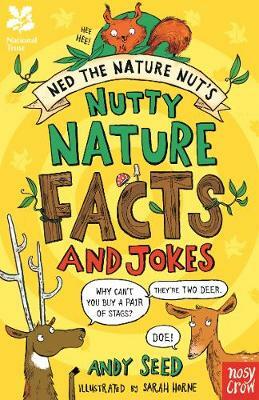 this book is full of amusing jokes to tell friends who love nature and awesome facts not many people know. This book is a joke book and it's really funny it also gives you wears but true facts! The jokes in this book were really bad, but some were (3)funny!The facts were interesting,though. i didn't really enjoy this book because some jokes were confusing and some (5)were hilarious! nutty nature is good of your outdoor facts but also has really fun jocks it's good for animal lovers and people who don't know that much about nature.I think that it's good for ever one 0 to 1000 year olds . see you later nutters. If you like nature this book will be a perfect book for you! This book has crazy jokes and fun facts!